Vacuuming Does NOT Count As Carpet Cleaning... Seriously. We like to think we can keep our carpets clean on our own, thank you very much. We just need to vacuum every month or so and blot when there's a stain... right? Wrong. What you're likely forgetting (or, if you're like us, what you never knew) is that almost all carpet companies require you to professionally steam clean your carpet every 12 to 24 months, to keep your warranty valid. In other words, vacuuming is not enough. Neither is steaming carpets yourself. Professional steaming is, like it or not, legally the only way to protect your carpet in most cases. And it's also a way to protect your health. "Indoor air quality can be eight to ten times worse than outdoor air quality, if you don't clean your flooring, clean your drapes and let air inside regularly," says interior designer Robin Wilson, who specializes in allergy-free housekeeping. When millions of Americans suffer from indoor allergies, air quality is a huge issue. 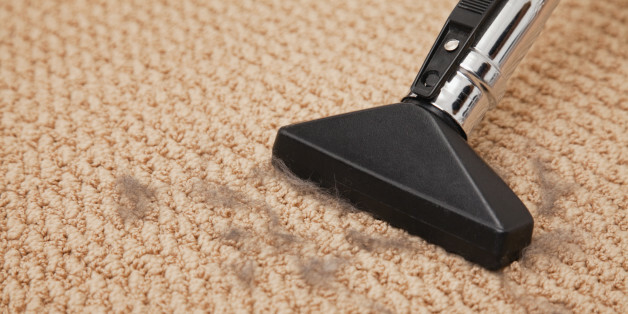 Call professionals to steam your carpet, more often than you think you should. Many carpet companies won't honor your warranty unless you hire professional cleaners every 12 to 18 months, says Carolyn Forte, a director at the Good Housekeeping Research Institute. In some cases the requirement may be 24 months -- check your carpet's warranty for specifics. Wilson, meanwhile, recommends even more frequent steamings in the interest of a dust-free home: she says to call in professional steamers every six months, and every four to six WEEKS if you have a pet. (Keep in mind this applies to carpets, not area rugs). Regardless of how often you choose to use them, our experts agree that professional steam cleaners are hands-down necessary -- you shouldn't attempt to steam carpets yourself. Only steam can effectively lift dust from deep within your carpet, Wilson says -- if left there, it will wear down and rip the carpet's fibers. But only professional machines can truly zap all the steam's moisture from the carpet when you're done cleaning. The results of trying to do it yourself can be sickening. "I've been on job sites where you pull up the carpet and see a mold patch," Wilson says. When you steam clean yourself, "you turn your house into an incubator for mold growth," Wilson adds. Between steams, vacuum at least weekly (or much more often with pets). Of course, vacuuming remains the easiest way to keep carpets and area rugs clean between steams -- our experts recommend vacuuming once per week, to keep those abrasive dust particles out of carpet fibers. Ramp up the frequency in high-traffic areas or if you have pets -- these spots might need daily vacuuming depending on how much debris you notice, according to Merry Maids Training Manager Debra Johnson. And take area rugs out for spring and fall cleaning sessions. Area rugs vary in their care instructions, so check yours for its ideal cleaning schedule. Generally, Wilson says, you should vacuum rugs with the same frequency as carpets, then deep-clean them every six months with a good old-fashioned broom-beating. Take rugs outside, shake them out, beat them with an actual broom (ideally while wearing a mask to protect your face), and let them air outside for a day. Many area rugs can also be steam cleaned -- if yours allows, you might steam it once per year, Wilson advises. "One of the most common errors people make when vacuuming is that they do it too fast," Johnson says. "Vacuuming slowly allows a vacuum cleaner to do its best work by vibrating carpet fibers and containing dust in the vacuum." Blot carpet spills immediately -- do NOT wait. Rubbing a stain will spread goo around and can distort the carpet's pile, or fluffy shape. And waiting to clean a stain lets moisture seep deeper -- Forte recommends cleaning spills the instant they happen. Spray carpet cleaner on a cloth and dab the stain, working from the outside to its center. Rinse with a clean cloth the same way, and then blot dry. To absorb leftover moisture, pile on a stack of paper towels and place a heavy pot or vase on top. Leaving it there overnight will ensure all wetness is fully zapped. Pick a carpet that's not a dust magnet in the first place. To prevent dust buildup in the first place, choose a low pile, Wilson says. This means picking a carpet or area rug with short fibers -- high layers of fluff or shag will trap more dust (not to mention mite carcasses... ew). Wilson recommends natural, durable materials like wool instead of synthetic ones like nylon. Carpet tiles are a stellar alternative to wall-to-wall carpets, she says -- when there's a spill, you can pull up the tile and clean it on its own, and you can remove them completely when you're ready for a scene change back to hardwood floors. "You can keep a rug for a lifetime, if you keep it clean," Wilson says. Carpet lifespans, however, range with quality -- some well-made varieties are made to last up to 15 years if kept dust-free, she adds. ...It's just a little more motivation to summon the steam machine.